Nasr, S., et al. 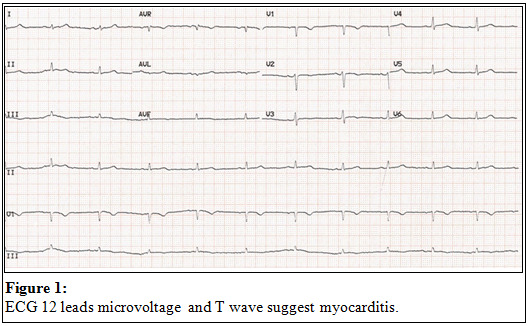 Arrhythmogenic Right Ventricular Dysplasia Case Presentation and Review of the Literature. (2016) J Heart Cardiol 2(2): 50-55. © 2016 Nasr, S. This is an Open access article distributed under the terms of Creative Commons Attribution 4.0 International License. An 18 years old female died suddenly while sunbathing. Her family consulted an electro physiologist. He scanned the family for long QT, Brugada and ARVD. 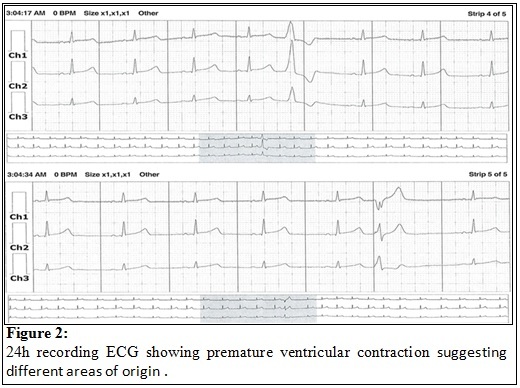 ECGs were performed on all the family members, which showed PVC’s in one of her cousins, for whom a 24 hours recording ECG showed 200 polymorphic PVCs. Echocardiogram was normal, and Signal-Averaged ECG (SAECG) is negative, he adopted a “watch and see” strategy (Figure 1-2). A month later, the cousin passes out in the GYM with ventricular tachycardia at 230 bpm. Luckily, the Gym is at 3 min from an emergency department where she was successfully resuscitated. ECG post arrest was suggestive of ARVD (Figure 3). The physician was certainly disheartened by this near death experience, knowing that this won’t be the last ARVD he misses. This cousin is a first degree relative of a sudden cardiac death victim without any other events in a family of seven siblings with a large extended family without sudden death. She only had premature beats. She was never syncopal. Following the ventricular tachycardia an ICD was implanted with two appropriate shocks in the last five years. CMR was positive in two siblings living abroad, one had an ICD implanted without therapies for 3 years follow up, and the other one is followed closely because of one minor criteria for ARVD. Thorough tests and screening were performed in almost half of the first degree family members, and CMR confirmed ARVD in one cousin who lives in a different country.